No games writing sticks in my craw worse than the assertion that the medium is somehow "still in its infancy." You probably have encountered one or more of its incarnations. Sometimes videogames are described as a disenfranchised teen, just waiting for that final growth spurt to mingle with the older kids - media like movies and literature that are old enough to borrow their parents' car keys without having to ask. Sometimes videogames are compared to the starry-eyed optimism of its youngest players, full of plucky spirit and bright-eyed optimism, ready to storm the castle and save the princess. And then sometimes you have the ultimate embarrassment of gaming thought of as still in utero, with interested parties speculating on what it will be when its born, a practice that has always given me an image of strangers rubbing a pregnant woman's belly like a magic 8-ball, eager to divine its contents. "Oh, feel him kick! Maybe he'll be a FIFA game!" I understand that this age-game serves a purpose, often working as a well-meaning promise of untold potential, but as a metaphor, it's entirely disingenuous. Worse, it's nothing that hasn't already been used with that other pop culture fixture, the lowly comic book. During the "growing up" of comics of the 80s and 90s, which saw a talented roster of ambitious artists and writers challenging the fundamentals of their medium, we were treated to a slew of writing trying to align this mature tack against the chrome tackiness of earlier fare. The result was two generations-worth of headlines reading "Bang! Zoom! Comics Aren't For Kids Anymore!" which really is actually an odd way to announce something as adult, if you think about it. You don't see a lot of "Wham! Smash! Remember to Fill Out Your Census Form! Kaplowie!" The lengths that articles of this stripe go to differentiate the bad old stuff from the good new stuff is staggering. I'll always remember one zealous article in a student newspaper that put Captain America's classic "Hitler-Punching" cover side by side with a vision of concentration camp horror from Art Spiegelman's Maus, as if to imply "See? In our comics, the Nazis win!" I'm inclined to find these types of endless age analogies already a little past their prime, and more than a little silly. Is gaming stuck in childhood, or in pimpled adolescence? Has it started thinking about girls, and growing hair in funny places? All this baby talk does is remind me that "baby" is also a verb. 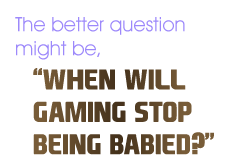 The better question might be, "When will gaming stop being babied?" For all our quibbling about the figurative age of videogames, it's easy to forget that aging doesn't work that way. We don't "crysalize" and emerge as beautiful butterflies. Rather, age finds us, at our most unguarded, and at our least expected. One day we're doing our homework; one day we're doing our taxes. It happens in the margins, and in the corners of our eyes. Maybe after one summer you return to school and find you're a head taller than everyone else. Maybe one day you doff your cap and feel your fingers brush the first wispy hints of a bald spot. Seen this way, we can be reminded of two fundamental facts of age: It is inevitable. And it is natural.